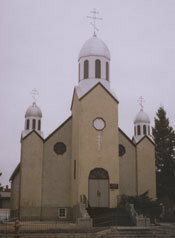 We are a multi-ethnic parish under the Ukrainian Orthodox Church of Canada. Our charter was established April 22, 1942, and we are a constituent parish of the Ukrainian Orthodox Church of Canada. The current building was created and built by the displaced Ukrainians after World War Two, who came to southern Alberta to work in the sugar beet fields. We are served by the Very Reverend Father Taras Krochak, (403-241-7742 or frtaras@stvlads.com) and are under the direction of the Congregation of Saint Vladimir (www.stvlads.com) in Calgary Alberta, and a beneficiary of the Southern Alberta Mission Project (www.stvlads.com/southernalbertamissionproject.html). We currently have over 14 ethnicities in the parish with the mission to live the Christian faith in Lethbridge. We welcome you to our website and to our church!